So the pendulum swings all the way to the other side. These Hollywood Reporter articles where we’re in conversation with actresses are so enlightening. Officially there must be men’s ones too, but you’ll notice they never get tweeted all over like the women’s ones do. So this year’s Unofficially Emmy Nominees Probably With Few Repeats From Last Year are Julianna Margulies, Vera Farmiga, Sarah Paulson, Claire Danes, Keri Russell, and Jessica Pare. So a great group, and hell yes let’s hear about some series we don’t talk about as much (well…Mad Men is kind of the exception here), but man, you do not exactly get warmth coming off of the page, do you? One of the things that’s weird about the interview format is that they cut out all the boring connective tissue. “Uh huh.” “Totally.” “Yeah.” So you go from Paulson saying “I was glad to get the work” to Farmiga, “I wanted that part”. Yow! It’s not the warmest, cuddliest group, not like last year. 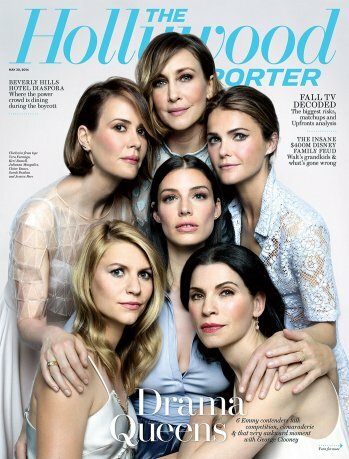 None of them are playing cuddly roles – Alicia Florrick is the most traditionally sympathetic but even she has a lot going on – and they don’t seem just soooo delighted with all their success. All of these women are straight up about having had a hard time getting work. Fighting for work. Fighting for the kind of work that was worth it. Claire Danes is all “Temple Grandin was a breakthrough and then nothing else happened.” And she’s an A-list name. Couldn’t get the offers! Keri Russell is the exception here, all “I didn’t want to work, get away from me with that script”. And indeed there was a period of time where I was in Brooklyn a lot, and saw Keri Russell a lot, and she wasn’t doing anything in particular at that time, and she seemed damn happy just ambling through New York. But given that I am avoiding spoilers about The Americans today because I wasn’t emotionally strong enough to watch it last night, I am glad she’s choosy. And kind of …reserved. That’s what makes the part good in the first place. That’s what makes the show so amazing. Why aren’t you watching The Americans? So it’s not a sleepover with your girlfriends. It’s closer to a sharing circle at a work conference. But it’s a lot more honest. And I kind of love that the flawed women we’re watching on television are played by women who have flaws and disappointments. It’s getting ever closer to real life. Except, of course, as was pointed out on Twitter – that is a lily-white group of women. Kerry Washington was involved last year and is also on mat leave, so OK, she’s not there, but if she’s not there, there’s nobody? Really? I mean, there isn’t, not in the same way. Archie Panjabi hasn’t had as varied a career. Lucy Liu’s show isn’t seen as prestigious enough, Sandra Oh’s, either. It’s maddening. THR is not totally responsible, with the narrow criteria they set for these kinds of roundtables, but it’s still bullsh-t. We can do better. Click here to read the THR article.